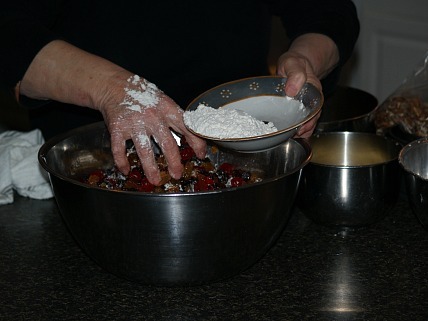 When I learned how to make an Irish whiskey cake, I found it is the traditional wedding cake recipe. 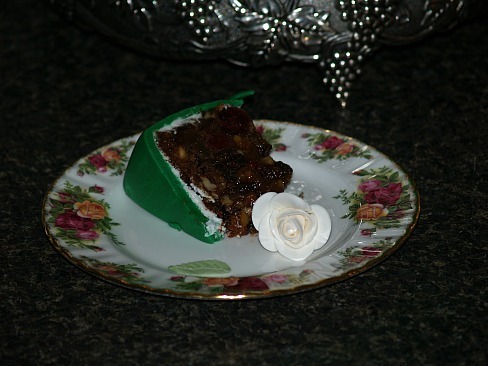 This rich fruitcake recipe is usually baked in three layers for a wedding cake recipe of Ireland. The top layer is generally kept for later consumption. This heavily fruited cake soaked with whiskey is best if baked months ahead of the wedding; it gets better with age. When I learned how to make an Irish whiskey cake (or Irish wedding cake recipe), I found there to be rich traditions surrounding the production of the whiskey distilleries. Irish whiskey was one of the oldest distilled drinks in Europe beginning in the twelfth century. There has been a big rivalry between the Irish and the Scottish when it comes to their whiskey. Irish whiskey comes from a mixture of malted and unmalted barley and other grains making it much lighter and neutral in flavor. When adding this alcohol to any recipe whether it is cakes, entrée, appetizers, desserts or cookies, it gives a subtle rather than strong accent to the taste. The Irish culture is full of traditions and Irish superstitions especially when it comes to weddings. As I was learning how to make this traditional Irish whiskey cake, I found that no true Irish couple would stray from this tradition or your marriage will go astray. Other Irish traditions and Irish superstitions involve the betrothal ring (engagement ring) which is handed down from mother to daughter and just how it is worn. Many more superstitions from a man (not a woman) has to be the first to wish the bride best wishes to after the groom arrives at the church, the doors are locked because men are known for getting cold feet and running away to what a bride wears and the music that follows the wedding. This recipe is the same as above but for Irish wedding cake making 15 pounds. Grease and line pans with wax paper cut to fit pans exactly so as to lay flat in the pans. Preheat oven to 300F degrees. Set a small pan of water on lower rack to form a steam. 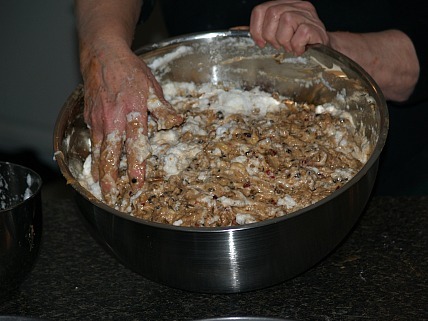 Prepare fruits and nuts by dredging in flour. Sift remaining flour and measure; Sift flour again with soda and spices. Cream butter, sugar and egg yolks until light and fluffy. Add molasses, apple juice, whiskey and strawberry preserves and blend well. Blend in the fruits and nuts. Fold in the sifted dry ingredients a little at a time. Beat egg whites until stiff peaks form. Fold into the batter.Fill pans three fourths full. Set pan on upper rack and bake 5 pound cake or less for 1 ½ hours; Cakes larger than 5 pounds bake for 2 ½ hours or until test done. After cooling, remove cake from pan and remove wax paper. While cake is still warm, drizzle with additional whiskey. Wrap cooled cake in wax paper and store in airtight container. 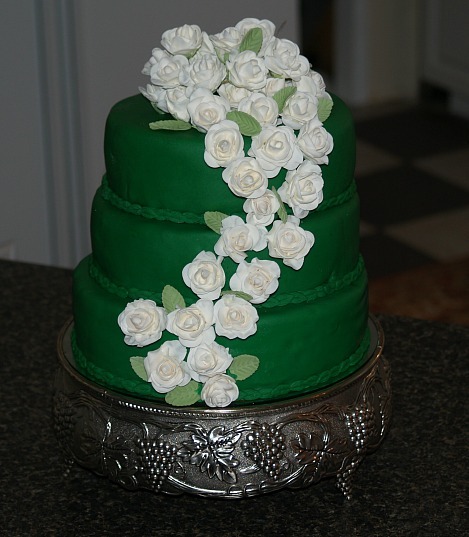 The Irish whiskey cake can be decorated like any other wedding cake. I baked batter in 3 springform pans: 8 inch, 9 inch and 10 inch. I baked all 3 cakes at the same time removing each one as it tested done: approximately 3 hours. For support in stacking the cakes, I inserted "dowels" in the bottom and second layers. 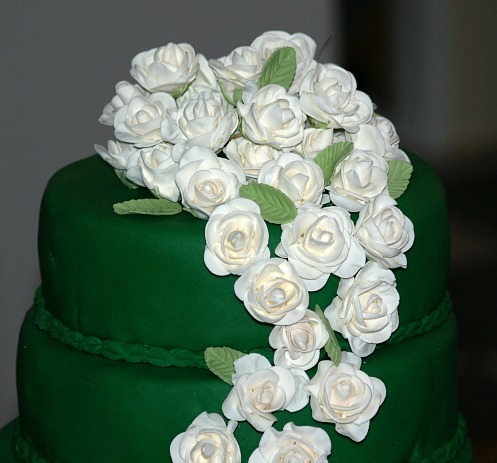 I covered layers with green fondant and decorated with white gum paste roses. This fruitcake recipe is a smaller version and is baked in a Bundt cake pan. Chop walnuts coarsely and set aside. Combine raisins, currants, candied fruit and peels with 1/3 cup whiskey and molasses; mix well, cover and let set overnight. The next day sift flour with baking powder, salt and spices. Cream butter and brown sugar; add eggs one at a time beating well after each. 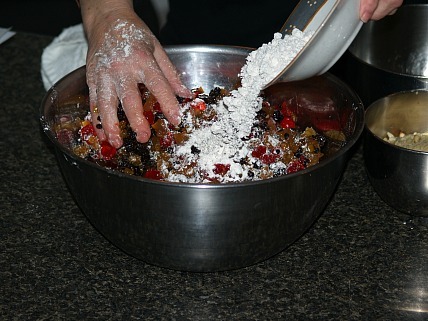 Blend flour mixture into creamed mixture; add fruit and walnuts and mix well. Turn into a well greased 9 inch Bundt cake pan. Place shallow pan of hot water on oven floor; place cake pan on lowest shelf of oven. Bake in preheated oven at 300F degrees for about 1 hour and 45 minutes or until cake tests done. Cool 10 minutes in pan; invert cake on wire rack to cool. Spoon remaining whiskey over cake slowly so it soaks in; cool cake completely. Mix small amount of powdered sugar with enough water for pouring consistency. Tint icing slightly with green food coloring and drizzle over cake; sprinkle with green sugar and arrange walnut halves on top.